Icewick exploits wicking action which utilizes a porous material or wicks that are incorporated within the grating or tile matrix. 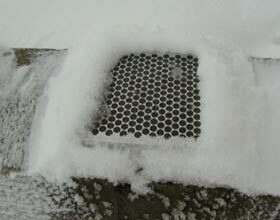 The base of the wicks are submerged in the anti-icing fluid such that it is drawn to the top surface of the grate. Thus, the formation of ice or accumulation of snow is prevented. A reservoir system feeds the wicks. The reservoir can either be a dedicated layer and/or be tied into an adjacent or remote reservoir via pumping. Recessing the wicks immediately below the surface allows the fluid to reach the icing substrate yet minimizing tracking. A key capability of the system is that the melt-water can be absorbed along with the diluted anti-icing fluid, rather than flowing to adjacent surfaces where it could cause other problems. The large surface area of the system helps to evaporate the melt-water. Thus, the full potency of the anti-icing fluid is maintained, and the melt-water is disposed of. Icewick works well with potassium acetate, which is a highly effective freezing point depressant. Its hygroscopic nature maintains the appropriate chemical potency in a changing moisture environment. It cannot dry out or over-dilute from humidity. Potassium acetate has a sufficiently low corrosivity so that it can be used on aircraft runways as well; it is applied as a liquid to temperatures as low as –29°C. The Icewick Grate comes in various profiles depending on the reservoir capacity and performance requirements. The standard thickness is 2 cm.